Making its rounds on the twitter feeds of various foodies and a few food-related listservs is the news of a family in Oak Park, Michigan that is in some trouble with local authorities for planting a vegetable garden in their front yard. The family put in the vegetable garden after work on an underground pipe required that they rip up their front yard. Instead of replanting with grass, they put in the garden to grow some food for their meals and to use in the education of their six children about food and where it comes from. According to city officials, a number of neighbors have complained about the garden, which does violate neighborhood ordinances that "regulate the aesthetics of the community". 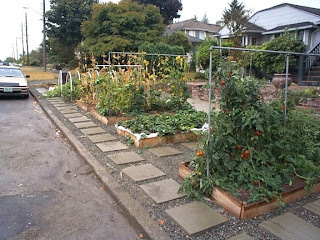 One city planner has been quoted as saying: "I don't know of any community where I have seen a full garden in the front yard. In planning and zoning, we try and put things in appropriate places." This raises the question of what exactly is an "appropriate" place for a vegetable garden? Must food production be hidden from view? Do gardens belong in the city? in the suburbs? Should they be in greenhouses? The idea that there is such an appropriate place - besides where vegetables will best grow and produce - is ill-concieved at best. The story is not yet complete, as the family has their court date, and the wide coverage of the story has led to an outpouring of support for the family, and protest against the city. An online petition is being circulated, and as of this writing, has nearly 17,000 signatures from around the globe. In these difficult economic times, and when the food available in the supermarket can not always be trusted, is the regulation of vegetable gardens such a good idea? Such gardens violate community ordinances around the country, so this may be just the first of such battles. Or better yet, plant some vegetables in your front yard as a message of solidarity! This is hilarious! People have such wacky ideas about appearances. Funny that growing vegetables is challenging the norm. Those peeps in Michigan should lay off the kool-aid. Sounds like not only could their six kids use the education on food and where it comes from but so could other kids in town and parents. Food isn't always "asthetically pleasing" but it serves a bigger purpose than finely trimmed bushes. If I were the family I would take it to the next step and start butchering animals in the front yard to show where meat comes from. That should really make their neighbors happy. Hopefully the support allows them to win the case. I think the veggie garden in the front yard is amazing, not only would it help feed the 6 kids but it looks great to me. Whats so wrong about planting a garden in the front yard? Maybe it gets more sun there. I wish alot more people would get rid of the boring grass in the front yards or on the hell strips owned by the city yet maintained by us and plant flowers and herbs or vegtables..to me it looks much more appealing! Is it green and being cared for? Will they be sharing with the neighbors? I don't think that what they do with their front yard should be controlled by anyone.I'm pretty sure that what they are growing is legal? More power to them.